Penelitian - Celltrion Healthcare said on Nov. 2 that it has won big tenders for Herzuma, its biosimilar version of Roche’s blockbuster breast drug Herceptin in France, the third-largest market in Europe. The company said it will have the upper hand over its rival biosimilar makers by securing deals from two procurement agencies for a major hospital association. The total order volume accounts for some 40 percent of the country’s trastuzumab market, consisting of the original and copy versions. The French market is worth US$312 million, the third biggest in the EU after Italy and Germany. 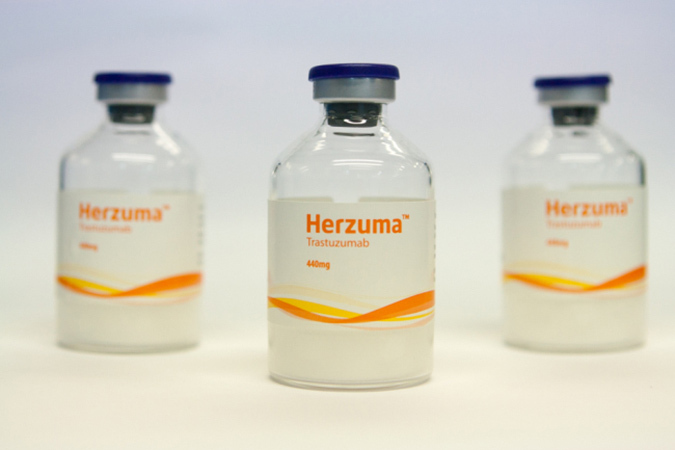 Herzuma was launched in August, following approval for the treatment of patients with early breast cancer, metastatic breast cancer, or metastatic gastric cancer from the European Commission in February. It is the third biosimilar in Celltrion’s portfolio to be approved by the EU after Remsima, its version of Johnson & Johnson’s Remicade and Truxima, a copycat of Roche’s Rituxan. “Remsima and Truxima are leading the market as first movers while Herzuma has successfully entered the French market based on the trust of the health care sector in the quality of Celltrion’s biosimilar products,” the company said in a statement. Other players are also vying for the trastuzumab market share include Samsung Bioepis’s Ontruzant and Pfizer’s Trazimera. Its first biosimilar Remsima, which holds a lion’s share of the infliximab market in EU, is facing price pressure and Celltrion is seeking to expand its product portfolio with the biosimilars Truxima and Herzuma. The market share of Truxima, which was launched in France before Herzuma, stood at 39 percent with Remsima at 52 percent as of end-June.